Known for spellbinding harmonies, the Finckel-Han-Setzer trio performs for the Candler Concert Series on Nov. 7. Photo by Daniel Ashworth. Arts at Emory has a wide variety of events in store for the month of November, featuring a new Theater Emory production, a Candler Concert Series performance, a reading from two of Emory’s Creative Writing Fellows, and a "Star Wars" themed concert from the Emory University Symphony Orchestra. Chef Billy Allin of the award-winning Decatur restaurant Cakes & Ale will give a "Three Sisters" cooking class based on the Native American diet at the Michael C. Carlos Museum on Nov. 2. at 7:30 p.m.
Emory Cinematheque continues to offer free, weekly screenings of anime films each Wednesday at 7:30 p.m. in White Hall Room 208 as part of a semester-long focus on animation and anime-inspired films from Japan. Titles this month include “Sky Crawlers “ (2008), “K-On! The Movie” (2011) and “My Neighbors the Yamadas” (1999). Theater Emory’s original production “The Meantime: A Time-Traveling Radio Spectacle” will run Nov. 5-15 at the Mary Gray Munroe Theater of the Dobbs University Center. The play, directed by Brent Glenn, is a celebration of 20th century live radio drama with the added flair of vaudeville entertainment. “The Meantime” promises an enchanting evening filled with radio broadcasts, music and dance from yesteryear. Tickets are on sale now. Catellier Dance Projects returns to the Schwartz Center for Performing Arts with “Fast First Fridays” on Friday, Nov. 6 at 6:45 p.m. with a brand new dance created by faculty member Gregory Catellier and a unique group of collaborators. October’s performance was standing-room-only, so come early to get a seat. Vega String Quartet offers a free preview of their debut concert in the prestigious Musikverein in Vienna on Nov. 6 at 8 p.m. in the Schwartz Center for Performing Arts. Considered the premier classical music triumvirate for their captivating performances and spellbinding harmonies, the Finckel-Han-Setzer trio will continue the 2015-2016 Candler Concert Series on Nov. 7 at 8 p.m. 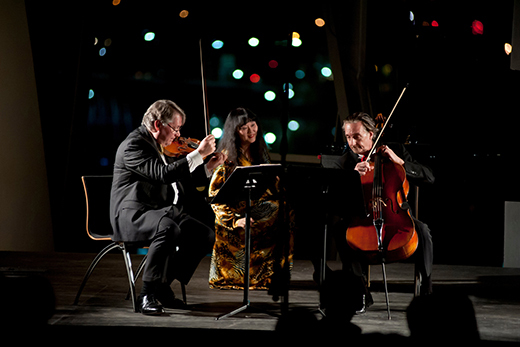 Audience members will hear a spine-chilling rendition of Beethoven’s "Ghost" trio from three award-winning musicians and master collaborators: cellist David Finckel, pianist Wu Han and violinist Philip Setzer. Tickets are on sale now. The Michael C. Carlos Museum will celebrate 22 years of Bacchanal on Nov. 7 at 8 p.m. It will be a memorable evening of music, drink and sumptuous cuisine, with a focus on the new special exhibition, "Indigenous Beauty." All fundraising proceeds from Bacchanal go to support the various programs offered by the Carlos Museum. Levin Arnsperger, Native Studies scholar and assistant director of Emory University’s ESL Program, will lead a discussion on LeAnne Howe’s novel "Miko Kings: An Indian Baseball Story" on Nov. 9 at 7:30 p.m. at the Carlos Museum as part of the Carlos Reads Book Club. Enjoy afternoon tea and scones at the Carlos Museum’s “AnitquiTEA” as Rebecca Stone, faculty curator of Art of the Americas, provides various viewpoints on the issue and discusses curatorial issues related to "Indigenous Beauty" on Nov. 12 at 4 p.m. The Emory Chamber Music Ensembles Program offers two free concerts on Nov. 15 at 4 p.m. and 7 p.m. at the Schwartz Center. The 2015-2016 Creative Writing Reading Series continues with a free event from Phillip Williams, Creative Writing Fellow in Poetry, and Lydia Conklin, Creative Writing Fellow in Fiction, on Nov. 16 at 6:30 p.m. in the Joseph W. Jones room of the Woodruff Library. Emory Libraries hosts a free creativity conversation with playwright Alfred Uhry on Nov. 18 at 6:30 p.m. in the Woodruff Library. Tickets are on sale now for the Emory Dance Company performances on Nov. 19-21. The shows will include new works created by Emory dance faculty George Staib and Gregory Catellier as well as feature work by Atlanta-based artists Mara Mandradjieff, MaryGrace Phillips, and Kristin O’Neal. Just in time for the "Star Wars: Episode VII" release, the Emory Symphony Orchestra performs “Star Wars: Suite for Orchestra” on Nov. 21 at 8 p.m. in the Schwartz Center. The concert is free and open to the public. Capping off the month are the Emory Mastersingers, who will offer a free concert in the Schwartz Center on Nov. 22 at 4 p.m.
As a reminder, Emory faculty, staff and students qualify for discounted music, theatre and dance tickets ranging from 20-100 percent the total ticket price.